2 Adults Without Home After Fireplace Ashes Start Blaze in Md. Two adults are without a home after improperly disposed fireplace ashes started a fire at their Rockville, Maryland, home Tuesday night. The homeowners found the fire in the garage of their Pasture Brook Way home at 10:45 p.m. and attempted to fight it, delaying the call to 911, Montgomery County Fire and Rescue spokesman Pete Piringer said. Piringer said a neighbor called 911 about the fire. The fire spread to other parts of the home by the time firefighters arrived. Fire crews quickly extinguished the fire and will return to the neighborhood Wednesday to talk to residents about fire safety. Piringer said fireplace ashes that were placed in the garage about an hour before the fire caused the blaze. 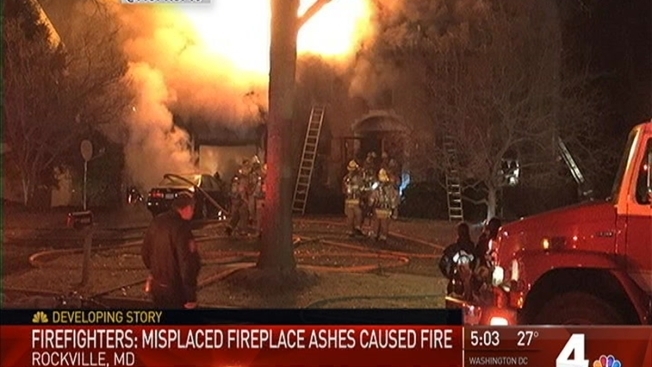 This is the second time misplaced fireplace ashes have destroyed a home in the D.C. area this week. On Sunday, a family of three was displaced from their home after fireplace ashes ignited a fire in their Fairfax County home.